Retrograde? 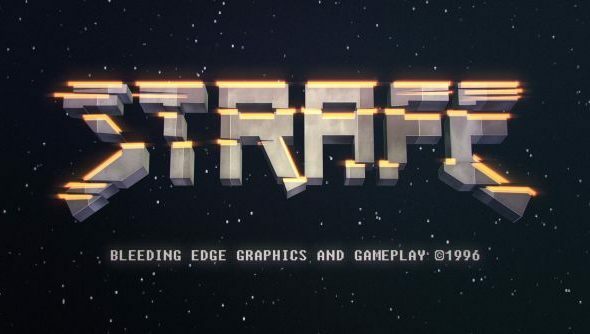 Strafe is taking us all the way back to sixth grade. I’ve made this ill-informed allusion to the American school system not only because Pixel Titans are making a shooter in the style of ‘90s id, but because their Kickstarter pitch video climaxes with the explosion of a child’s head. You have been warned. Pixel Titans are selling Strafe as the bloodiest and best shooter of alterna-1996. When id made Commander Keen, they took pride in the fact that enemy corpses stayed where they were – monuments to player action that they’d rediscover if they returned to past haunts. Pixel Titans have tackled Strafe with the same ethos; players will paint levels red with the gibs of their enemies – “your twisted work of art”. But it’ll all be gone upon permadeath, at which point they’ll face a new procedurally-generated level in which everything has changed. The plot of Strafe finds the player returning from space scrapping mission to discover their mothership unresponsive but teeming with hostile life. “Prepare for hours of uninterrupted chaos that won’t stop for storylines or anything short of a melted CPU,” say Pixel Titans. The scrapping conceit extends to looting, however: the player can collect scrap from enemy corpses to craft armour and ammo, or give it to merchants in exchange for perks and power-ups. Unsure whether you’ve been swayed by the faux-’90s thing? Better reach up and check whether yourface is still there.